Batik Convergence is a collaboration of four full time artists who develop, create, and show batik watercolor fine art. 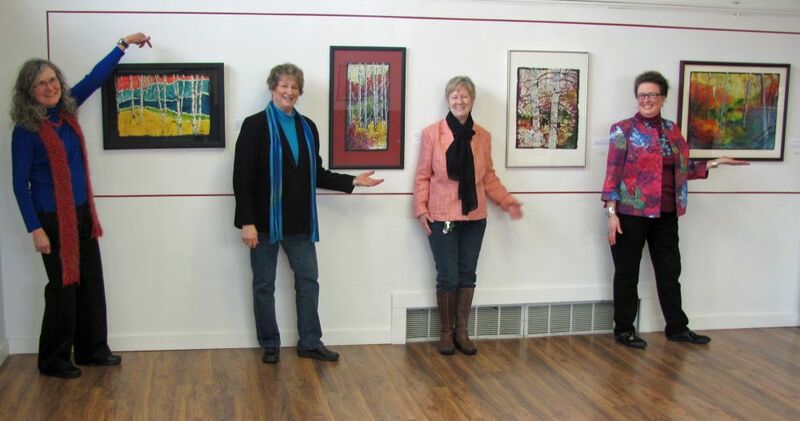 Artists Jan Clark (janclarkstudio.com), Sue Orlaske (orlaskeartworks.com), Linda Peterson (lindampetersonartworks.com), and Denise Elizabeth Stone joined forces in 2008 to explore this unique art medium. The batik watercolor process utilizes water media such as watercolor, gouache, acrylic to paint on handmade papers. The final product is unique in its brushed ink strokes and distinctive color shadings. After mastering the basics of the batik watercolor process, the four artists collaboratively developed techniques that further enhance the alchemy of ink and wax in the creation of these fine art pieces. They consider their work to be a convergence of artistic inspirations, techniques, and media. The artists of Batik Convergence have shown their work in Oregon galleries in Baker City, La Grande, and Pendleton. They can be contacted through their websites. Below: Sue Orlaske, Denise Elizabeth Stone, Linda Peterson, Jan Clark.